I have made a lot of things for my buddies over the years and this is, by far, my favourite creation. make me tops for them. I also purchased the glue to attach the tops. I had plans! It just so happened that I had received a Christmas coffee mug as a gift. It came in a cellophane box full of little balls of styrofoam. The static electricity in the box kept the balls clinging to the sides and jumping around. It gave me a BRILLIANT idea! 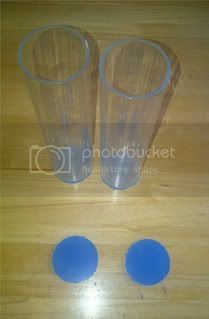 I enlisted my daughter’s help to transfer the balls out of the box and into the cylinder. (She had also received a coffee mug gift and I wanted her styrofoam balls, too.) 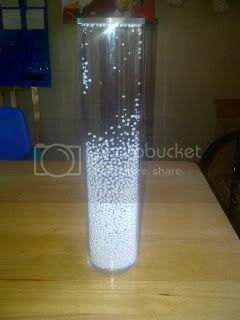 It was no easy task getting these balls from point A to point B, they wanted to fly everywhere BUT inside the cylinder! Finally we got as many in the tube as we could and I GLUED THE TOP ON, trapping them forever!!!! Ha ha! The super cool thing is, they continue to cling to the edges of the cylinder like they did the inside of the box. Shaking the cylinder or rubbing the side of the cylinder makes the little balls jump around. Tapping the cylinder gently forces them slowly to the bottom. Shake it and they distribute along the inside walls again. Kids and adults alike have been mesmerized with this thing. I have yet to create anything better than this.